When a plant becomes too big for a solid pot, the roots begin to circle and choke each.Give them room to breathe! The net pots' slotted mesh sides and unique ventilation hole allow air to dry out exposed roots, which keeps them naturally pruned to prevent circling and tangling. You can lock up the outer and inner pots by rotating them, equally unlock them by rotating them in opposite direction. Comfortably-sized lip along these containers, making them easy to grab and lifting. For decorative pots that perfectly appoint both your orchid and your home. 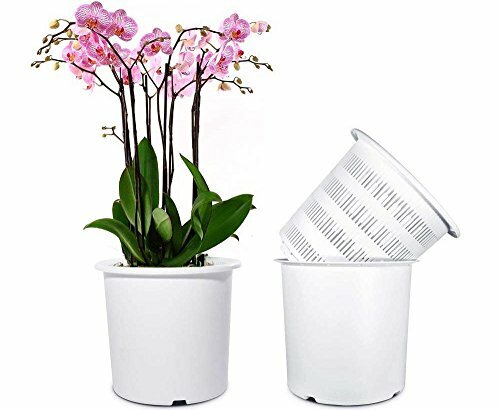 By using the Mkono Orchid Pots, the rate of water and nutrient element uptake is increased and therefore ideal aerobic conditions can be achieved to promote healthy root growth. Mkono Plant Pots are specifically designed for Orchidaceae, such as Orchid, Dendrobium, Cattleya. It also suitable for common plants. Root control design. Slotted pot can effectively lead lateral root's grow better and distribute uniformly, the nets allow more airflow to the root zone prunes the root structure and prevents circling. Outer and Inner Pots Set: Both of pots have holes in the bottom, allow better drainage for orchids. The inner pots with slotted vented sides promote orchids growth through aeration. Material: High quality PP plastic, the outer pot's surface is matte white. Package included: 2 inner net pots and 2 outer pots. Pot are approximatively 7 1/2" wide by 6 3/4" high. Please note that plants are not included in these items.